Halloween is my absolute favorite holiday, hands down. 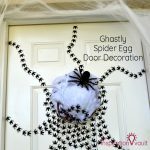 This year I plan to have a multi-age Halloween party at my house and plan to make most of the decorations and food myself. 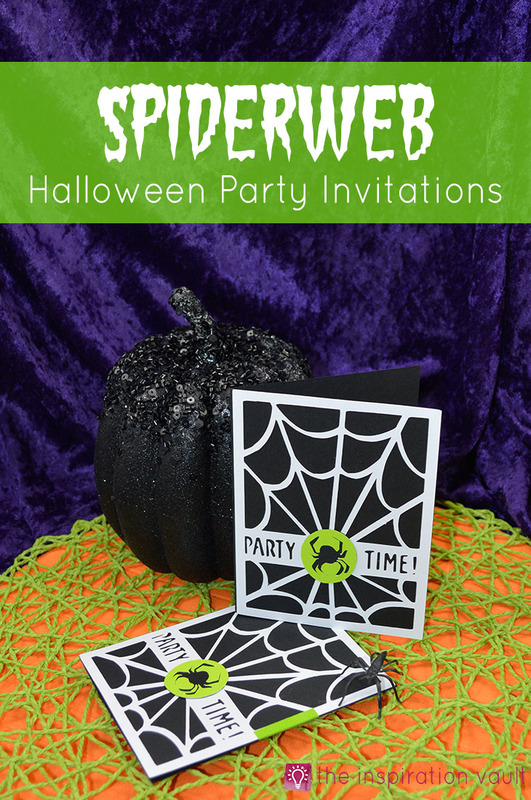 Since every party starts with an invite, I decided to make these fun Spiderweb Halloween Party Invitations using my Cricut. I love that I can crank them all out in very little time, but they look like I spent time creating each one by hand. Shh, it’ll be our secret. Step 1: Load the Creepy Critters Cartridge and select image 7. 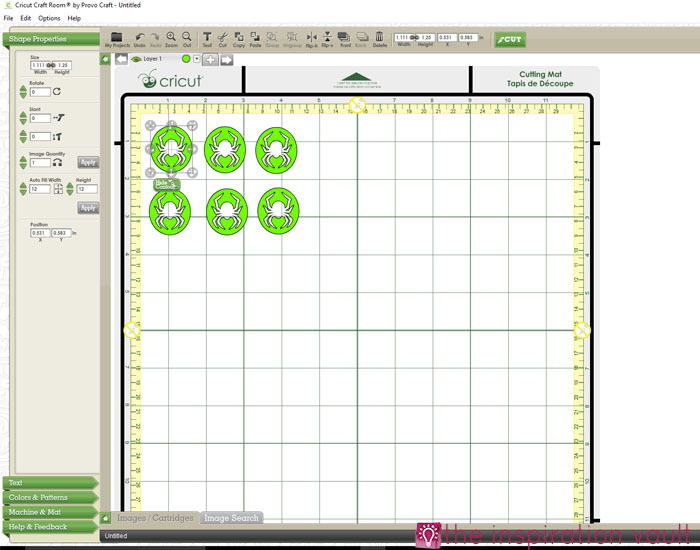 Set the height to 5 inches and copy/ paste to make two. 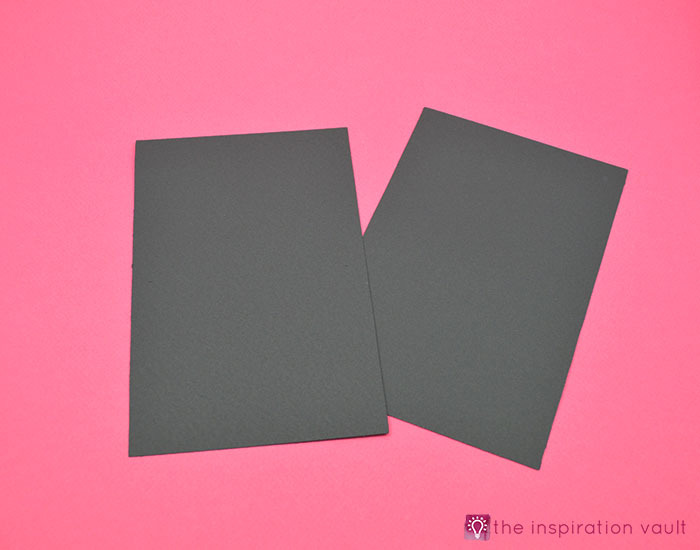 You can fit two invitations per 12×12 piece of cardstock. Cut as many as you need. 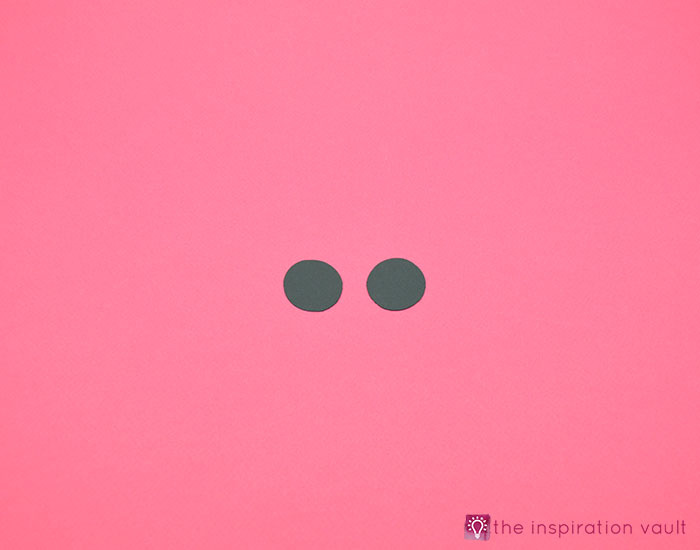 Step 2: Select image F1+7. Set the height to 5 inches and copy/ paste to make four. 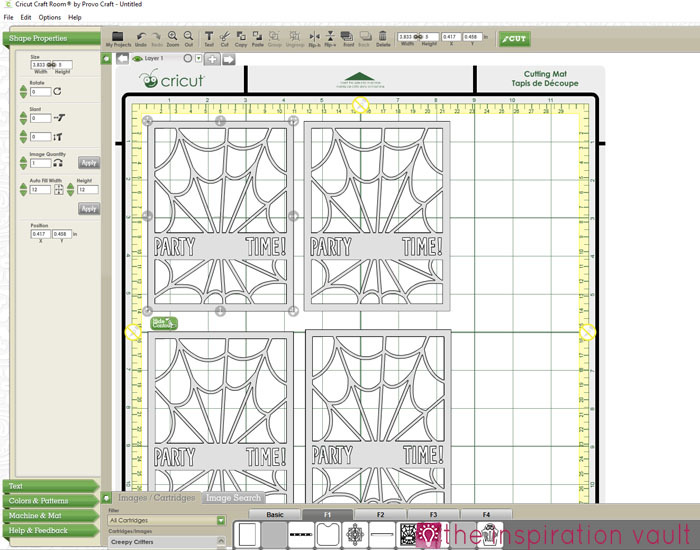 You can fit four webs per 12×12 piece of cardstock. Cut as many as you need. Step 3: Select image F2+7. 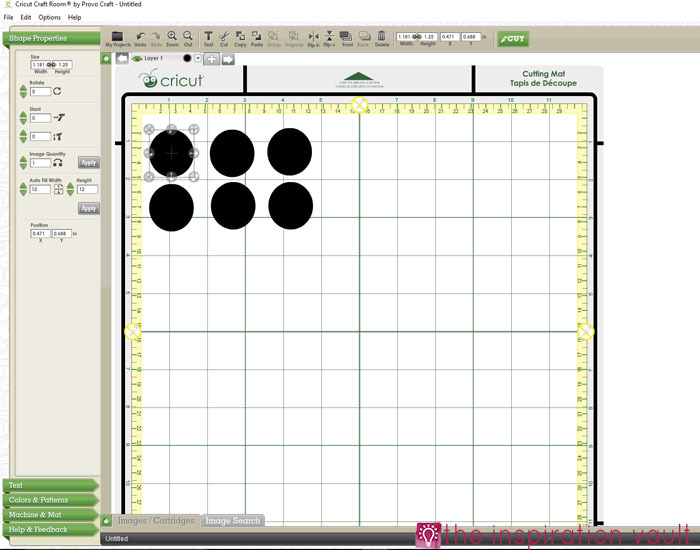 Set the height to 1.25 inches and copy/ paste to make as many as you need. You should be able to fit them on the scraps of the black from Step 1. Step 4: Select image F3+7. 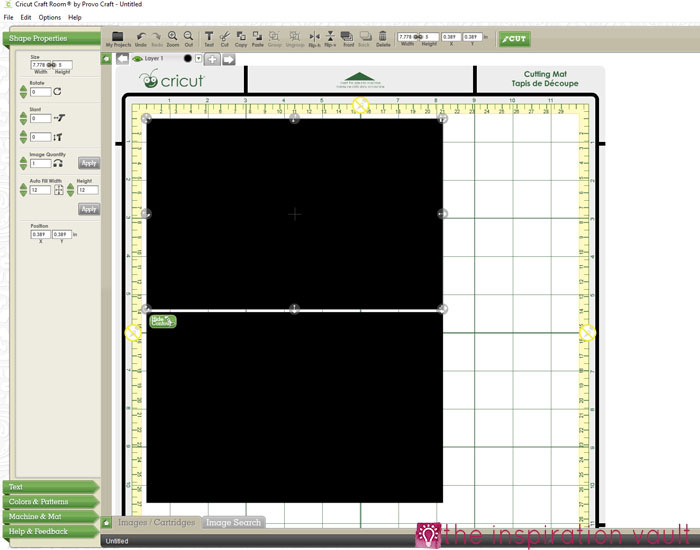 Set the height to 1.25 inches and copy/ paste to make the same number as in Step 3. 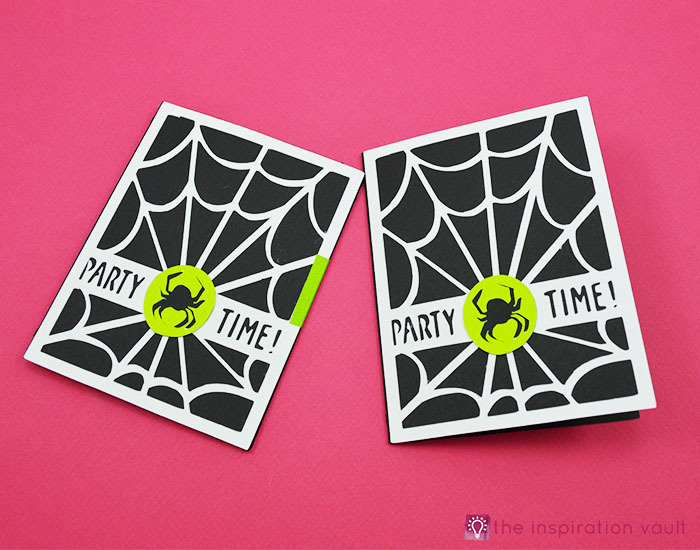 Cut on the lime green cardstock. 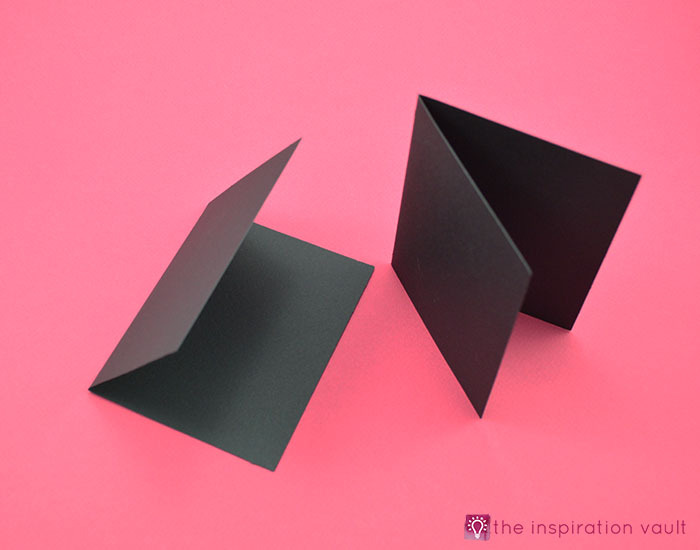 Step 5: Fold the black card cuts in half at the notches. 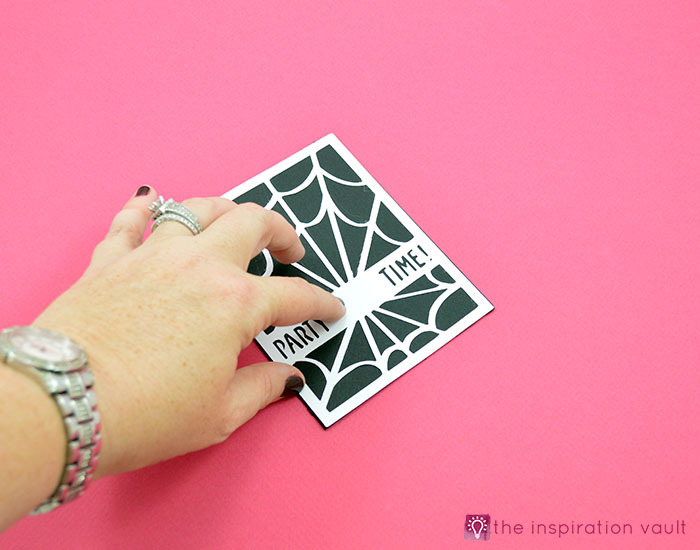 Step 6: Apply adhesive to the backs of the spiderweb cuts and stick to the front of the black cards, making sure to match the edges. 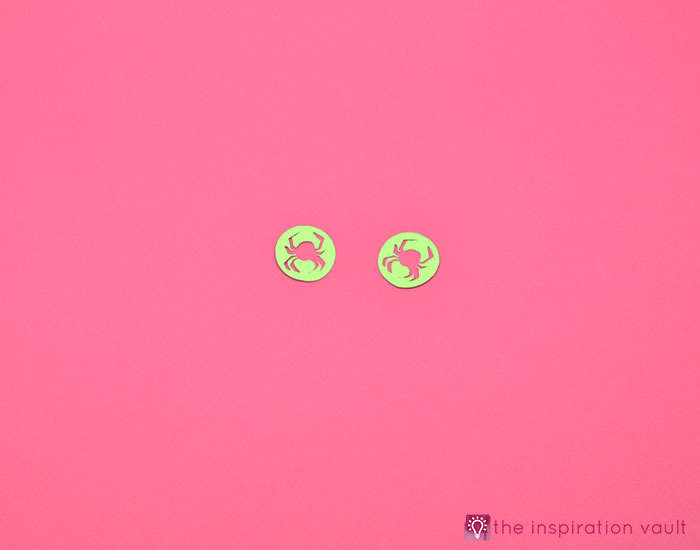 Step 7: Adhere the green spider cuts to the black circle cuts. Trim off any black that shows on the edges. 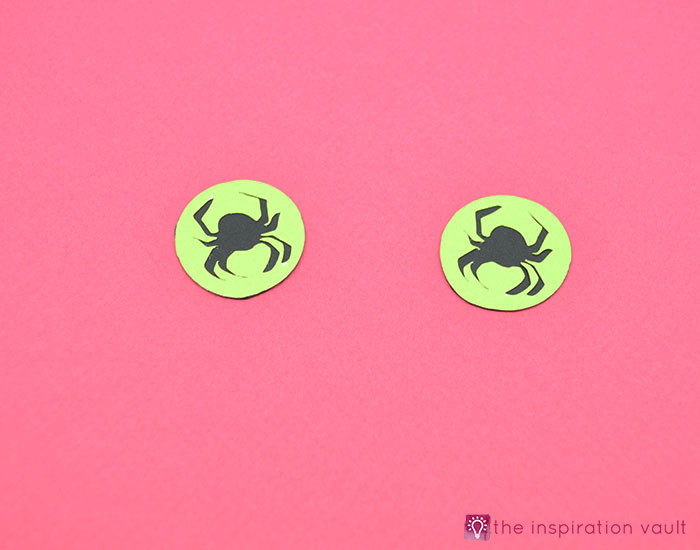 Step 8: Now, stick the green spiders to the front of the cards. Step 9: Either print out or write in white paint pen, your party information for the inside of the card. 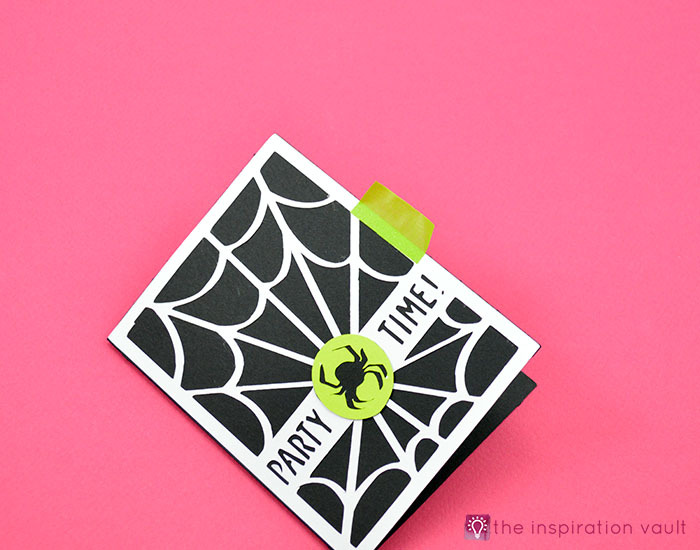 Step 10: If you don’t want to buy or make envelopes, you can give or even mail these Halloween Party Invitations with help from a bit of washi tape. 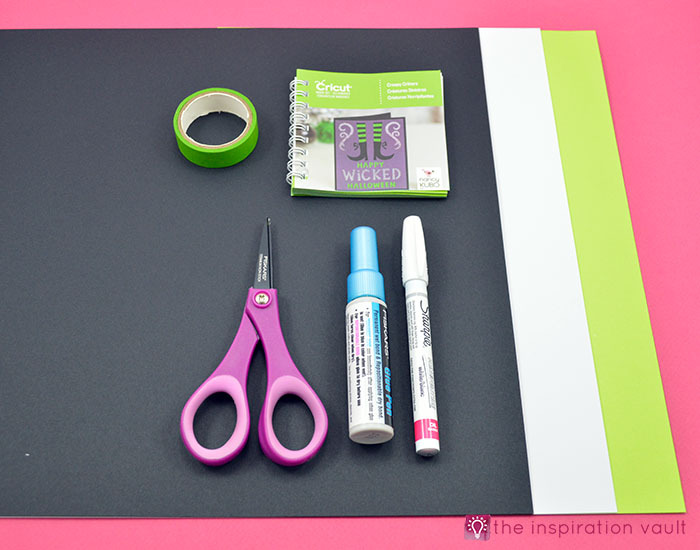 Measure out a 1-inch piece of washi tape and place it lengthwise, halfway off the center right side of the card as shown in the photo. 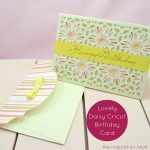 Then simply fold it over both edges of the card, sealing it closed. 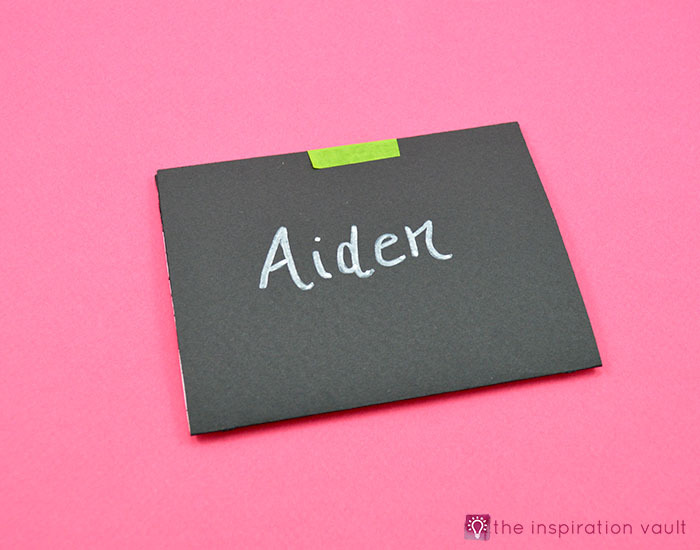 Step 11: Then, you can just write the name or name and address of your party guests with the white paint pen on the back of the invite. That’s it! 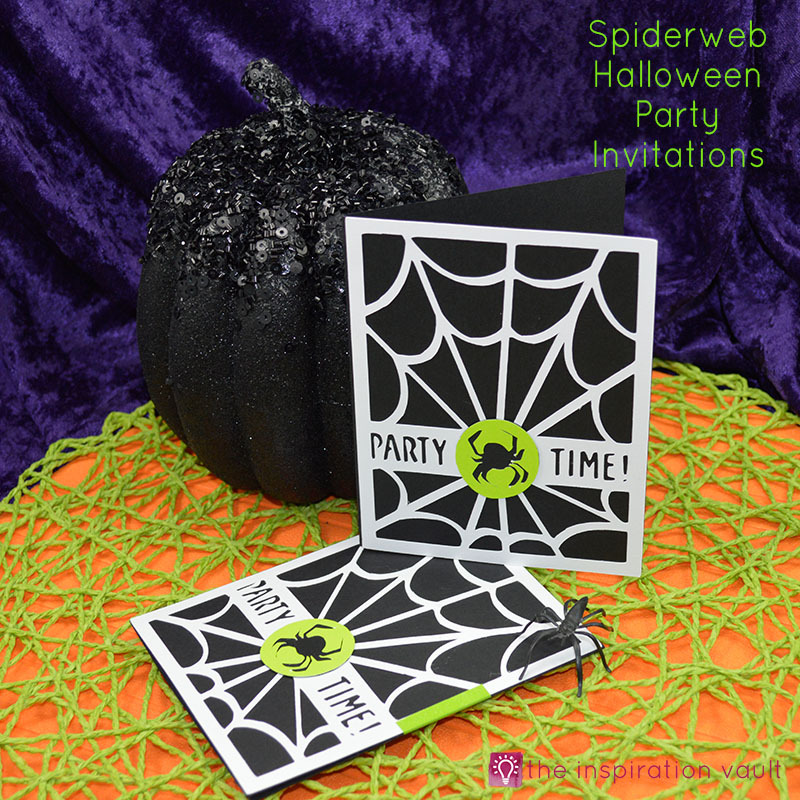 Of course, these Spiderweb Halloween Party Invitations are completely customizable as far as colors and embellishments are concerned. 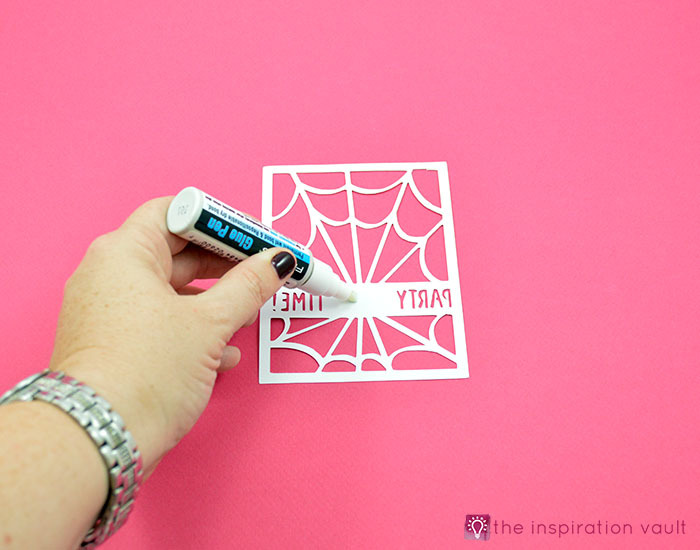 You could even use little plastic spiders instead of cutting them out on the Cricut. 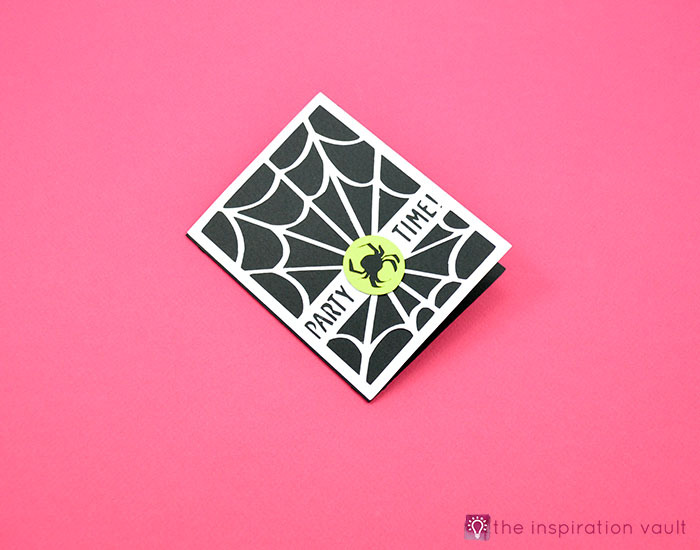 If you liked this project, be sure to check out our other Halloween Crafts and Handmade Cards. 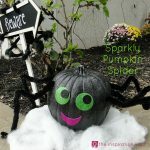 If you want even more ideas, follow our Halloween Party Inspiration board on Pinterest. 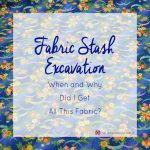 Do you love free printables! ?